On March 2nd, we had North Andover v. North Andover final for the Home Grown Winter Lacrosse League. The referees were suspect, but a fun victory for ALL players. Champions on both teams and a great way to end the winter session! We're ready for SPRING! Registration begins on November 1. While registration is open, the nalax.net website has a “REGISTER NOW” icon on the home page; all payments are made via credit card through the website. A late fee will be applied after January 15th, 2019. Questions about registration can be sent to . The season begins in late February with weekly indoor sessions (approximately four per season), typically on Sundays at Home Grown Indoor Sports (400 Osgood St. North Andover, MA 01845). These are informal practices designed to get sticks in, or back in, kids’ hands. The cost for indoor sessions is included in the spring registration fee. Once the indoor sessions are underway, teams move outside as the weather permits. When Mother Nature is kind to us, we are outside at the end of March. The Town of North Andover makes the decision as to when the fields are playable, as is the case throughout the season. Games start in the last weekend of March / early April and end in mid-June. Typically teams participate in the Jamboree for the girls, or the MBYLL Jamboree for the boys (which is the largest boys’ lacrosse jamboree in the nation), which occur in mid-June. Each league (MBYLL [www.mbyll.org] for the boys’ program, and Founder's North League [www.fgll.org] for the girls’) mandates that we field teams of equal strength within each level. The coaches use the indoor sessions and early outdoor practices to gauge each player’s skill level, then work together in order to create balanced teams. Team rosters and final practice schedules are set typically in late March. Games are on Sundays; times vary week to week. Both Founders and MBYLL are a “travel” league. We play opposing teams in the Merrimack Valley, Cape Ann, and North Shore regions. Average travel time for away games is 30 minutes. Our home games are typically at NAHS or Carter Field. Typically teams practice twice per week for 60 - 90 minutes each session. Most practices are on weekday afternoons, and some teams have Saturday morning practice. In the girls’ program, the entire level (for example, 3/4 girls) practices at the same time and place each week. In the boys’ program, most practices are group practices where multiple teams of the same level will practice together, allowing for more scrimmage opportunities and in-game tactical instruction. The practice schedule for both programs is determined by field availability and coaches’ availability and usually finalized with teams at the end of March (after the indoor sessions). NALAX uses a grade-based system for division of levels. 1/2 is 1st/2nd grades; 3/4 is 3rd/4th grades, 5/6 is 5th/6th grades, and 7/8 is 7th/8th grades. We also take into account an age-based system designed by US Lacrosse. If you have concerns or questions about which level is most appropriate for your child, please don’t hesitate to let us know (email addresses for boys’ and girls’ program directors are below). New players will be provided a reversible game jersey as part of their 2019 registration fee. If a replacement jersey is needed, it can be ordered at registration time for $25. Players provide their own shorts and socks, preferably black. Players also provide their own cleats or sneakers. Each player is responsible for having appropriate equipment. Girls need a women’s-game stick, protective goggles, and mouthguard. Boys need a men’s-game stick, helmet, shoulder pads, arm/elbow guards, gloves, mouthguard, and a protective cup. For families that choose to participate in multiple sports, it is inevitable that there will be some conflicts. Our coaches understand this and our policy as a recreational program is to not penalize players with less playing time in games due to absence at practices. 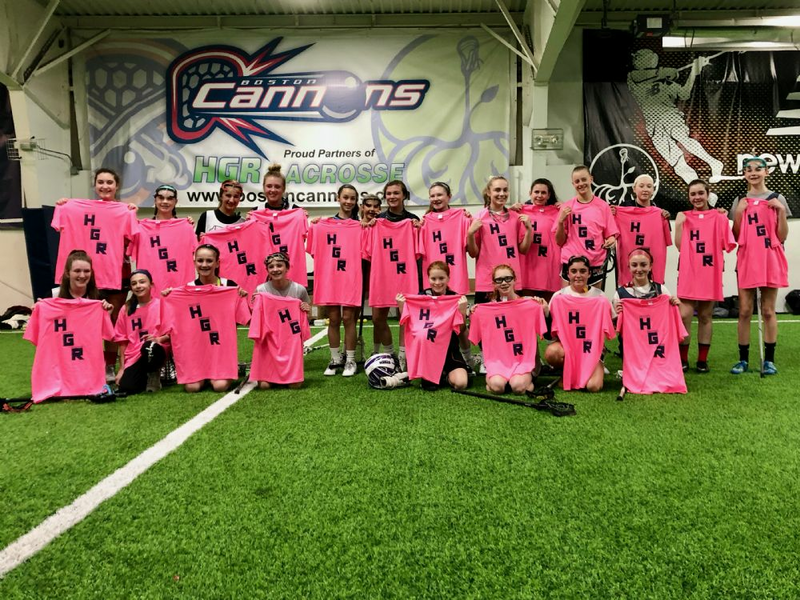 We certainly encourage attendance at all lacrosse practices in order for each player to improve and therefore have more fun; however, we know that players have a variety of commitments. When conflicts arise, we ask that parents keep the coaches informed so that practice plans and game plans can be altered if necessary. Our number one goal is to provide a great experience with the game of lacrosse for all participants. We received this kind email through our website: "I had the pleasure of officiating the Pentucket Memorial Day tournament and I was so impressed with the North Andover coaches and athletes. Their hearts and minds are in the right place."